One of the members of my local society gave me the opportunity to ransack his Russia duplicates stockbook (Hi Jim!). And although I'm quite amazed how often I've already had to attach the label 'Russia' to my posts here, my collection of that vast country is really almost non-existent. 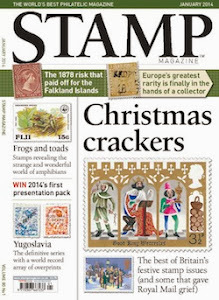 So I was quite chuffed and managed to find loads of stamps that I didn't have yet. 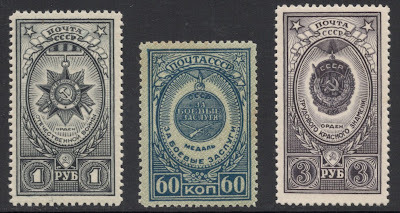 What surprised me was that so many of the early Soviet Union stamps still have that old Imperial feel to them. Stamps you wouldn't associate with a communist country at all. It would almost seem as if the satellite countries tried harder to be communist in their stamp design than the mother country itself! Take for example this beautiful stamp from 1925. Okay, it depicts Lenin, but the stamp design is very regal, and made more so by being recess-printed. Not a single hammer or sickle in sight. Or what about this beauty then? 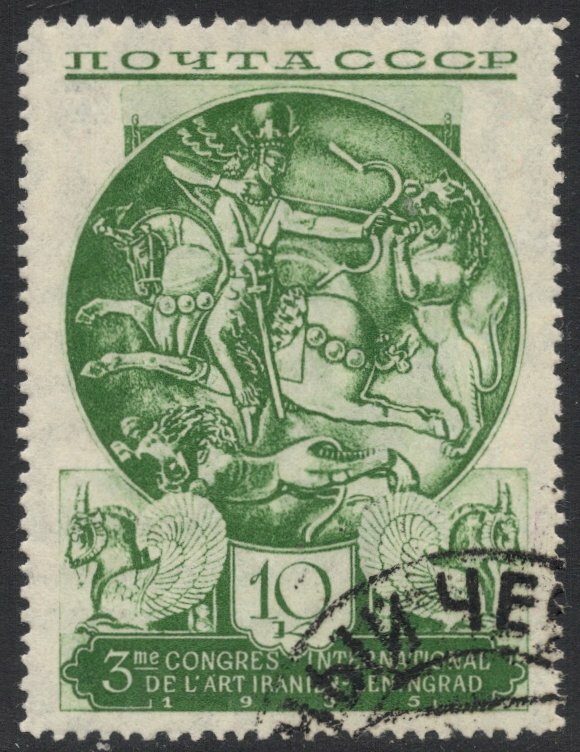 It was issued in 1935 to mark the Third International Congress of Persian Art and Archaeology in Leningrad. Again not a stamp you'd associate with the Soviet Union. Pity there were only used copies in the book, so I'm just showing you this here and then I'll put it back because I only collect mint. Definite highlight was the series of War Orders and Medals, which started in 1943. It started off modestly enough, with just two stamps, recess-printed and designed by A. Mandrusov. Many more sets were added to the series from 1944 to 1953. And they were larger too, with some sets consisting of 15 stamps. They all had the same basic design with different medals or orders in the centre. A second type, introduced in 1944, was smaller in size, printed in letterpress, and also available as imperforate stamps. Other than that they worked on the same principle: same frame, different types of orders and medals shown on each stamp. 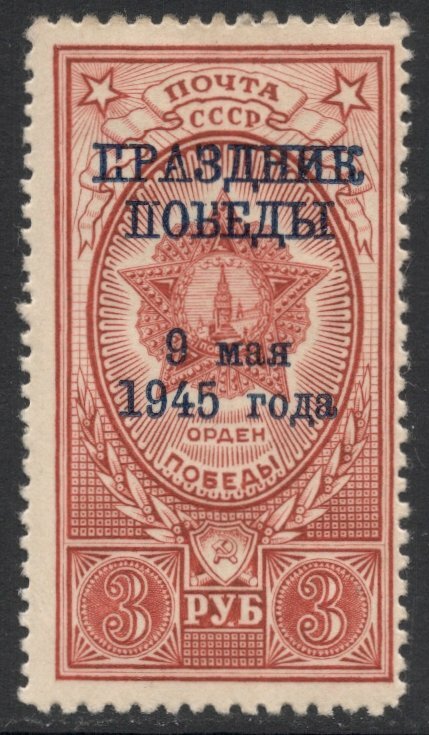 Left: 1943 recess-printed stamp depicting the Order of the Great Patriotic War. Centre: Letterpress version of 1946 depicting the Distinguished Service Medal. Right: The Order of the Red Banner of Labour from the final set. They were all issued in dark, muted colours, giving them a slightly solemn feel, and they look absolutely stunning when arranged nicely on a page. 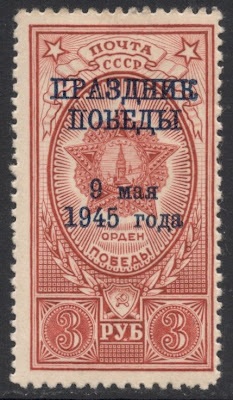 As a nice finale (though later normal sets were added) there was this one stamp issued on 20 August 1945, to mark Victory Day in Europe, which was 9 May 1945 for Eastern Europe. 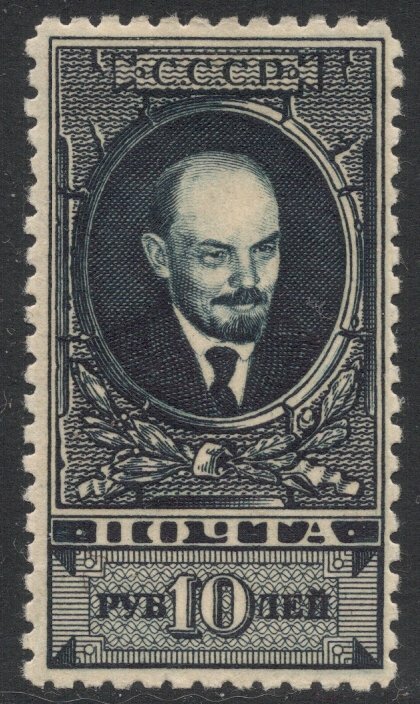 A stamp from the 1945 set, depicting the Order of Victory, was reissued with an appropriate overprint. It just goes to show that there are hidden gems in each country's stamp catalogue, which is why it is so great to be an all-world collector! Indeed, Adrian. Why just last week I spent a few days cataloging my own (mostly communist-era CTO) stamps. 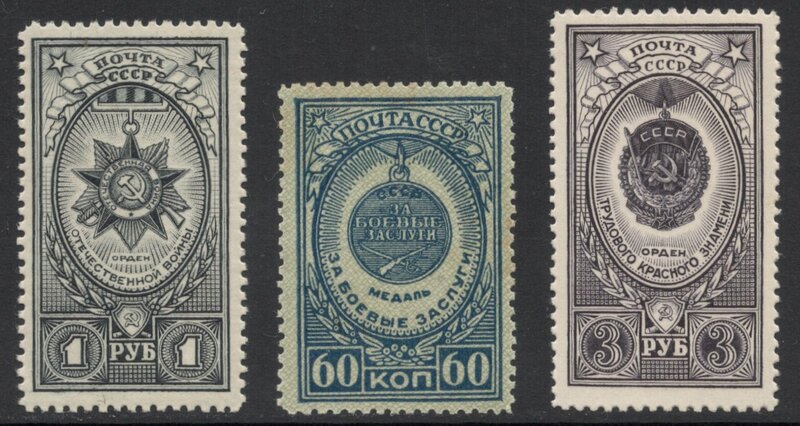 I must say that although a lot of stamp purists decry the whole CTO system, some of them were MAGNIFICENT-looking stamps, even if your average soviet peasant would never in a million years have seen or used them.